We recently received a CV from a candidate with the following advice placed at the bottom (would this fit into our CV Blooper series? Quite possibly..). I have edited it for a bit of content - eg the writer recommended 2 pages max but we think a CV can be as long as it needs to be for someone with experience. The remainder is a very effective and useful guide to reviewing your own CV. 1. Check and recheck for spelling and grammar. Attention to detail is absolutely key so ensure dates, names of companies etc are all correct and never use abbreviations or colloquialisms. Ask someone you trust to proof read your CV as a new pair of eyes can often be useful in identifying mistakes. 2. In order to demonstrate a professional image it is best not to use fancy fonts or include graphics, photos or colour of any kind. Ensure spacing, alignment and font style is consistent throughout the document. 3. Do not include personal details such as date of birth, nationality, religion, gender, marital status etc. 4. Write your CV in the first person but remove the ‘I’ e.g. ‘Responsible for…’ as opposed to, ‘I was responsible for’. 5. Employers want to see what practical skills you have to offer and what you can actually do. Therefore keep all information factual and use professional, concise and clear language. 6. All strengths must be evidenced. 7. Avoid gaps in the chronological order of your CV. Employers/recruiters will always ask if there appears to be a gap in your employment or education. 8. Once you have established a standard CV with all relevant details included, you can tailor it to suit whatever opportunity you are applying for. A lot of employers, especially large organisations, will be expecting at least a 2.1. Many will also expect good A-level grades. You can be successful with a 2.2 but you’ll have to be able to offer additional skills and experience. Any form of work experience shows that you have commercial awareness i.e. you understand the world of business, company structure and politics. You can develop that awareness by reading good quality newspapers; especially the financial pages. A team player. A good listener who gets on well with people from different backgrounds and can win respect and confidence from others. This may also be evidenced by good negotiating or persuasion skills. Time management, organising skills, people management, able to get things done on time and to a high standard. Able to prioritise. Able to see the wider picture. Flexible and able to take on new ideas. Use of word processing packages, spreadsheets, financial accounting packages, e-mail, internet. Able to understand financial statements and interpret financial information. Familiar with business and accounts terminology. Jonathan Fagan is Managing Director of Ten-Percent Legal Recruitment and a non-practising Solicitor. Ten-Percent Legal Recruitment provides online Legal Recruitment for Solicitors, Legal Executives, Fee Earners, Support Staff, Managers and Paralegals. Visit our Website to search our Vacancy Database. 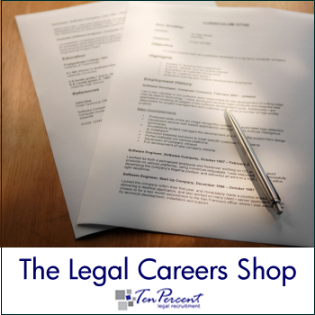 Our Legal Careers Shop has eBooks on CV Writing for Lawyers, Legal Job Interview Guide, Interview Answers for Lawyers, NQ Career Guide, Guide to Finding Work Experience or a Training Contract and the Entrants Guide to the Legal Profession. "I went to watch a court case in the old bailey where a young man was being cross examined (a term I learned there ) for a drug charge. He represented himself without a lawyer and I was surprised by the strength of his rebuttals (another term I learned there) and also by how eloquently and respectfully everybody talked in the court. When leaving I decided that I was a bit more sure that I wanted to ingeniously use a thorough knowledge of the law as a career. I decided to enter a Cambridge Law essay competition where the question was “Should we repeal the human rights act 1998 “. The effort and private study I put into this essay was proof enough for me that I was compatible with a law career. I naturally feel I gravitate towards law, I love writing, studying and thinking about it. I haven’t been able to get an opportunity to explore any fields of law which I hope to do in summer."